Comprehensive step by step by step tutorial on build Grails 3, MongoDB and Vue.js Profile CRUD (Create, Read, Update, Delete) Web Application. Previously we have to show you how to build CRUD Web Application with the famous Angular 5 and React.js. Now, we will use Vue.js as front-end framework that will be working together on the same project with Grails 3. Using this profile will create 2 application, they are Grails 3 as server and Vue.js as Client. The scenario for this tutorial almost same as previous tutorial using Angular 5 or React.js profile. They are creating, read, update and delete Customer data. CRUD mechanism using RESTful API provided by Grails 3 and visualization using Vue.js as the front end. Before moving to the steps of the tutorial, make sure you have installed above requirements. Open the terminal or command line then go to your Grails projects folder. 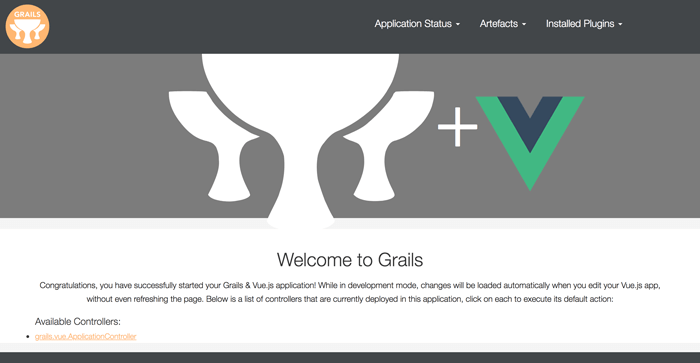 Type this command to create a new Grails 3 application with the Vue.js profile. Go to the newly created Grails 3 application folder. Now you have server and client folder inside this project folder. You can run server or client only by type this command. To run both of them together, use this command. Node.js and its dependencies will be downloaded automatically. The vue.js application will run using port 3000 and Grails 3 using port 8080. Now, open the browser then point to `localhost:3000` then you will see this page. You will get this response on the browser when you change the address to `localhost:8080`. To save or populate MongoDB data, first, we have to add Gradle dependencies for MongoDB. Open and edit `server/build.gradle` file then comment out all Hibernate and H2 dependencies then add dependencies for MongoDB. Compile Grails 3 application by typing this command inside Server folder. Next, open and edit `server/grails-app/conf/application.yml` then remove or replace in-memory H2 database and Hibernate configuration with this. Now, we are ready to create a domain class for Customer data. In the terminal or command line inside Server folder type this command to enter Grails 3 interactive console. Create a new Grails 3 domain class by typing this command. Open and edit `server/grails-app/domain/grails/vue/Customer.groovy` file then Replace all codes with this. That it's, just modify a domain class we have a RESTful API for Customer data CRUD operation. Now, it's a time for testing a CRUD (Create, Read, Update, Delete) operation. We will use `CURL` command for this. Open the other terminal or command line tab then run MongoDB server if there's no currently running MongoDB server. Run again the Server by using this command in previous terminal tab after type `exit` in the Grails 3 interactive console. Open another terminal or command line tab again then type this command to get Customer data/list. The correct response should be like this. Next, save or post a single data to the Customer endpoint. You will get this response when data saved successfully to MongoDB database. Now you have your RESTful API ready to access from the Vue.js front-end application. Don't worry about the CORS for using the different port because it already enabled by Grails 3 default configuration. Now, it's time for Vue.js or front end part. 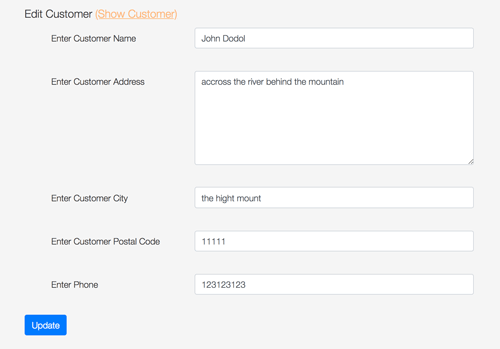 First, create or add the component of the customer list, show, edit and create. Create all of those files inside components folder after go to the Client folder. Now, open and edit `client/src/router/index.js` then add the import for all above new components. 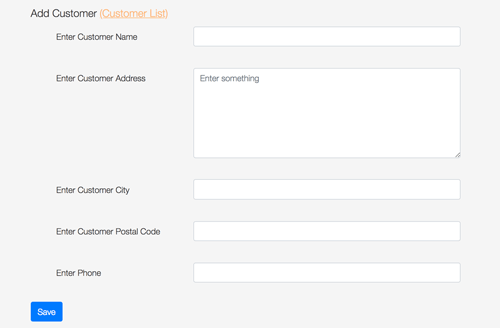 Previously, the file for customer list component is created. For UI or styling, we are using Bootstrap Vue, to install it type this command on the terminal. Open and edit `client/src/main.js` then add/replace the imports for Bootstrap-Vue. Next, we are using Axio for accessing RESTful API that provided by Grails. To install it, in the terminal type this command. Now, open and edit `client/src/components/CustomerList.vue` then add this lines of codes. Now, open and edit `client/src/components/CreateCustomer.vue` then add this lines of codes. That code contains the template for customer form, the script that contains Vue.js 2 codes for hold customer model and methods for saving customer to RESTful API. Open and edit `client/src/components/ShowCustomer.vue` then add this lines of codes. Delete function also includes this component inside methods block. For editing customer that chooses from show customer page, open and edit `client/src/components/EditCustomer.vue` then add this lines of codes. This component almost same as creating customer component, except for load customer data by id and method for update data using `PUT`. This time to test all complete the Grails 3, MongoDB and Vue.js Stack configuration. Type this command to run again this web application. And here the application looks like, now you can test all CRUD functionality.